Family Volley: Ubooly and a Holiday GIVEAWAY! Ubooly and a Holiday GIVEAWAY! The last few weeks I have had the opportunity to work with a number of great companies. Their products are perfect for gift giving. Over the next few weeks , I want to introduce you to a few of these companies, in hopes that their products make your holidays easier. Continuing our ode to gift giving, today I want to share with you another great gift. You can find my first two suggestions here and here. Be sure to enter the giveaway at the end of this post. Today I want to introduce you to the newest member of our family. Ubooly. Ubooly is a creative and educational creature that is powered by your iPhone or iPad touch. (Works with iPhone 3GS, 4, 4S, 5 as well as iPad touch 4G and 5.) Ubooly is a plush toy. 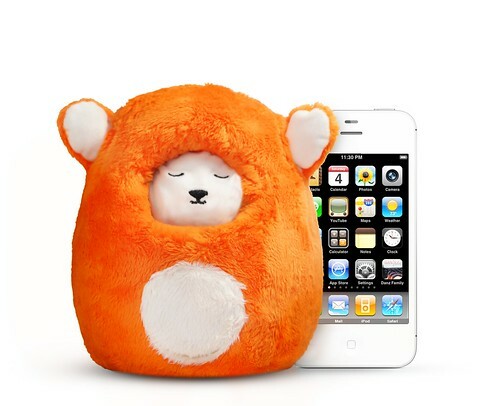 You slide your device inside and by running an app, your phone or ipod becomes the interactive face of the plush character. Ubooly comes to life, ready to be your child's new friend. Always full of surprises, Ubooly can play interactive trivia games, play pretend, tell stories with fun choices (think choose your own adventure), tell jokes, tell fun facts and can play music. 1. Download the free Ubooly Pet App. (Available in the App Store). 2. Slide your device into Ubooly's pocket. 3. Ubooly comes to life and listens to what you say. 4. Ubooly automatically updates with new activities every month. Our kids have loved having Ubooly around. The most magical moment when our children first played with Ubooly was with our 4 year old. My husband slide his phone into the pocket and when Ubooly's face lit up, our daughter gasped in excitement. Her favorite feature is that Ubooly plays music. Our son loves the jokes Ubooly tells. He memorizes them and then tells his friends at school. The Ubooly experience is completely different than anything our children have played with before. For starters, Ubooly is accurate. There is nothing more frustrating than an interactive toy that doesn't understand what you are saying. This tech savvy plush toy communicates in a real voice and understands what is being said. Ubooly is also different because it rarely, if ever repeats itself. Most interactive toys seem to run on a cycle, and if your kids play with the toy enough, it repeats itself. Not Ubooly. Plus, your Ubooly will automatically update every month with new information, free of charge. No subscriptions or monthly fees. Another feature that makes Ubooly different is that over time, she will learn your child's favorite activities and interests, and will tailor her responses to match your child's preferences. Recommended for children ages 4-9, but I have to say, our 10 year old son loves Ubooly, and our 18 month old little girl is fascinated when Ubooly turns on. She carries Ubooly around and babbles to her. Another great perk is that when my phone is in Ubooly, it is protected from little hands who might drop it. You can play catch with Ubooly and your iPhone or iPod touch is safe. Priced at $29.95, Ubooly is a very reasonable gift for the children in your life. Just be ready, you will want to play with her a little too. Want to win your own Ubooly. Of course you do! Delivered in plenty of time for Christmas. And one less gift you have to buy this holiday season. Moms are some of the most savvy mobile users and so are their kids. Ubooly is a toy designed for this new high-tech generation. While learning and sharing new content every week, Ubooly is the only toy that grows with your child. It encourages listening skills, and a break from high-energy / high-stimulation play. Through stories & interactive games, Ubooly’s curiosity is sure to awaken the creativity within your child’s imagination. Ubooly is the hot toy of the season, it’s new to the scene and is on track to sell out this winter! Free updates through Wi-Fi creates ongoing entertainment for kids. Click here to adopt your own Ubooly and get FREE SHIPPING now! This is a sponsored post written by me on behalf of Ubooly. The opinions and text are all mine. I would give it to my daughters, they are 3 and 5 and they would love it! I would give it to my son, but I will probably get more out of it for the next little while haha I love toys! I would get this for my youngest who is 8. Evan would love it and he's been begging for his own iPod and I could let him use it with my old iPhone from Korea!! My kiddos are a little old for this but my niece would love this! This looks great! I would give it to my nephew. He'd love it! I would give him to my daughter! She would LOVE him! My boyfriend of a 2year just broke up with me and am 28 weeks pregnant. I have cried my self to sleep most of the nights and don’t seem to concentrate during lectures sometimes I stay awake almost all night thinking about him and start to cry all over again. Because of this I end up not having energy for my next day’s classes, my attendance has dropped and am always in uni and on time. Generally he is a very nice guy, he ended it because he said we were arguing a lot and not getting along. He is right we’ve been arguing during the pregnancy a lot. After the break up I kept ringing him and telling him I will change. I am in love with this guy and he is the best guy I have ever been with. I’m still hurt and in disbelief when he said he didn’t have any romantic feelings towards me anymore that hurt me faster than a lethal syringe. He texts me once and then mainly to check up on how am doing with the pregnancy, he is supportive with it but it’s not fair on me, him texting me as I just want to grieve the pain and not have any stress due to the pregnancy. i was really upset and i needed help, so i searched for help online and I came across a website that suggested that Dr Ahmed can help solve marital problems, restore broken relationships and so on. So I felt I should give him a try. I contacted him and he told me what to do and i did it then he did a spell for me. 28 hours later, my boyfriend came to me and apologized for the wrongs he did and promise never to do it again. Ever since then, everything has returned back to normal. I and my boyfriend are living together happily again.. All thanks to Dr Ahmed. as it is a place to resolve marriage/relationship issues, do you want to be sure if your spouse is being faithful to you or Do you want your Ex to come back to you Contact. : E-mail: Ahmedutimate@gmail.com or call/Whats-app: +2348160153829 save your crumbling home and change of grades its 100% safe. I suggest you contact him. He will not disappoint you.